Murphy's Rooftop Company, at 3655 N. Sheffield Ave., makes money from offering views of Wrigley Field from its rooftop. WRIGLEYVILLE — Wrigleyville rooftop owners will take the Cubs to court if the team blocks even some of the views, the association representing owners said in a release today. 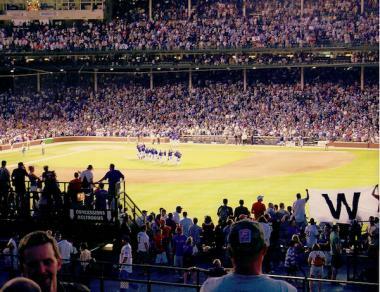 News came out Thursday that the Cubs expect a finished deal with the city and Ald. Tom Tunney (44th) to include a jumbotron in the field that may impact some rooftops. The size is yet to be determined. The Wrigleyville Rooftops Association said Friday that any decision that impacts even some of the businesses "is in direct violation of the current 20-year agreement," the statement said. "Any construction that interrupts the rooftop views will effectually drive them out of business and be challenged in a court of law," the statement said. Beth Murphy, of Murphy's Bleachers, and a spokeswoman for the rooftops, has repeatedly said the rooftops have not been at the negotiation table or been shown potential signage plans. She is "deeply troubled" that the 16 rooftops were not involved though their contract was at stake. "Rooftop owners reserve the right to use any and all means necessary to enforce the remaining 11 years of our 20-year contract," she said. The Cubs have asked for eased restrictions, including on the landmark ordinance that prevents signage, to help fund a $300 million renovation of the field. Tunney has refused to support it unless the team addresses details like parking, traffic and security. He has also said in the past that a respectful contract must be worked out between the team and the rooftops before he will agree to a deal. But Tunney told the Tribune Thursday that the rooftops and the Cubs must work out the issues themselves. The general assumption has been that Tunney would fight for the rooftops' rights behind closed doors, but Murphy expressed earlier this week that she did not think the alderman would be able to help the rooftops. "The alderman cannot negotiate on behalf of the rooftops," she said. "He has a myriad of interests to represent." The Cubs and Wrigley Field are 95 percent owned by a trust established for the benefit of the family of Joe Ricketts, owner and CEO of DNAinfo.com Chicago. Joe Ricketts has no direct involvement in the team's day-to-day operations.